There are 3 reviews so far. To add a review of your own for this item, visit the voting page. 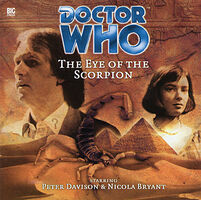 The oginal idea of Doctor who was within the historic and Peter Davidson's Doctor is at home in the past. The introduction of a new companion is welcome as the this Doctor is better with a full crew. allowing more depth and twists in the story lines. Which this story makes full use of, with Peri playing a stronger than normal part. The most import thing is that unlike Charley and the 8th Doctor, a woman from Egypt is affriad of the unknow and cannot accept everything. This one is much more highly rated than I would give it. The reasons for my lower assessment are mainly the huge number of cliches in the story. All the chariot and battle sequences do not come off at all well, sounding wholly unrealistic. The villain Yannis is so one-dimensional that the edge of a playing card would seem like the Great Wall of China compared to him. Mass intelligence mind control has already been done in the Yeti stories. Everyone except the Doctor seems too easily taken in by wholly transparent plots, such as the forged letters and lost heirs. There are strengths to the story. There are some funny bits when the Doctor has to explain the embarassing parts of Egyptian culture. Peri again gets a much stronger role than in the TV series. Erimem's doubts are convincingly portrayed. The real saving of this whole story is Caroline Morris making her debut as Erimem, the pharaoh of wherever it is. She is my favourite audio companion, and its sad that The Bride oF Peladon has now come and gone. But her finale was far better than her debut. Not her acting, just the script. I was expecting this story to be a real big one, like a doctor who version of the mummy. But this isnt anything like Pyramids of Mars, even with the scorpions and battle scenes. Nicola Bryant and Caroline do seem to gel well, its just a pity the rest of the story is pretty much run of the mill. The aliens, whoever they are, arent overly impressive either. This is one of the few weaker big finish tales. Peter Davison being out for nearly an episode doesnt help either, and he just comes back in episode three. The only effective scenes are the battle at the end, and the 10 minute court scene. Otherwise this is pretty dull stuff. Egypt is pathetically represented too. No real eygptian sound scape either. Plain.